Tibet2Timbuk2‘s song “Jhi Chung” was played (although quite mp3ed) on C-Realm episode 126: Horticultural Consciousness. C-Realm is a great podcast, covering a wide range of topics related to consciousness and the evolution of our species. Have a listen, and get a sneak preview of T2T2’s upcoming CD “Music is Life”. The CD launch is on next Saturday, November 15 at the Brisbane Powerhouse. The latest C-Realm episode, 131: Rocky Top (show notes here), features Tibet2Timbuk2‘s award-winning Crane Song for the musical interlude. The main show features guest Albert K. Bates discussing possibilities of societal transformation and collapse, especially with regard to resource depletion and a return to local organic food production. 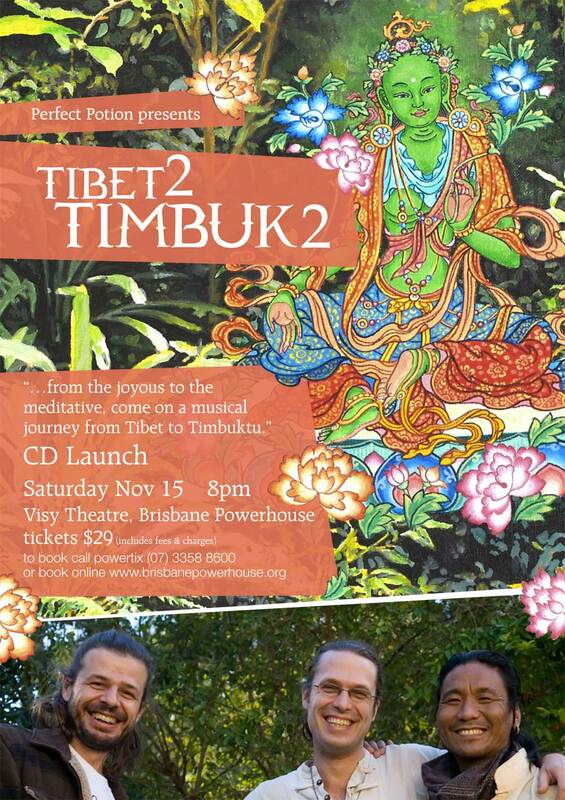 Doug Spencer of ABC Radio National‘s Weekend Planet will be playing a track from Tibet2Timbuk2‘s debut CD “Music is Life” this Saturday Dec 13, between 10pm-12pm. PS You can listen to the program via this link. Apparently the song was played at 1138pm, so you should be able to hear it in the second hour of the program.